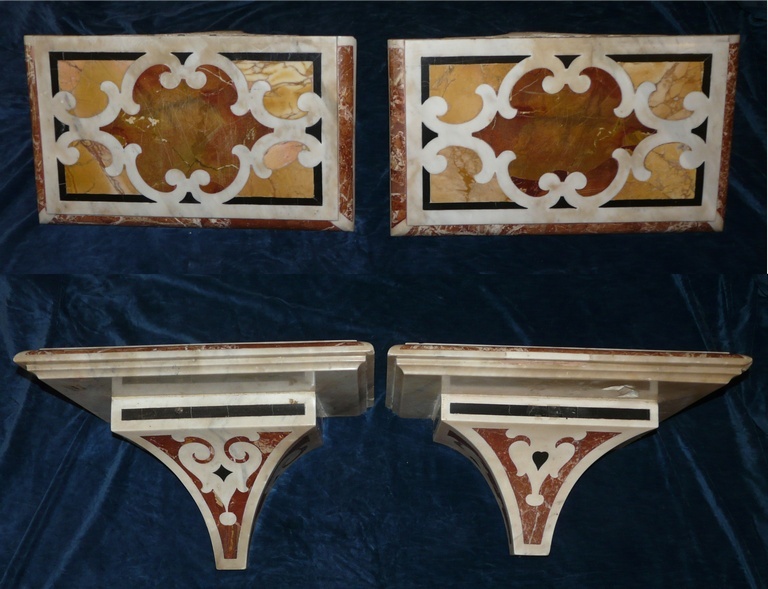 A semi pair of 18th \ 19th Century Venetian inlaid marble wall brackets \ shelves, W: 20.5" x D: 12.5" x H: 11.5"
Pair of 19th Century Italian carved alabaster urns, C1870s. H: 26.5" x W: 8.5". Pair of Texas Longhorn Horns. A pair of extra large Texas Longhorn horns, Each 34" long. 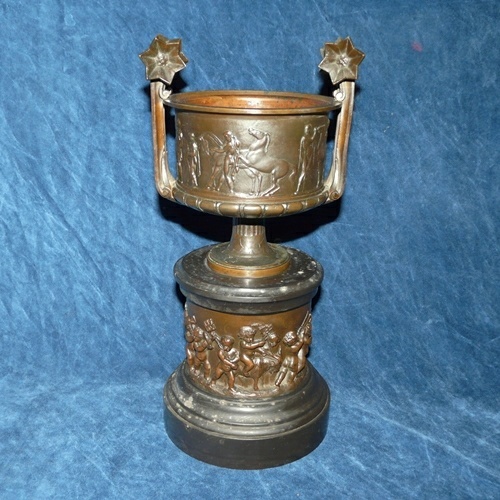 A Continental filled bronze or copper classical urn, C1920s. H: 10.5" x W: 16.5" x D: 15". 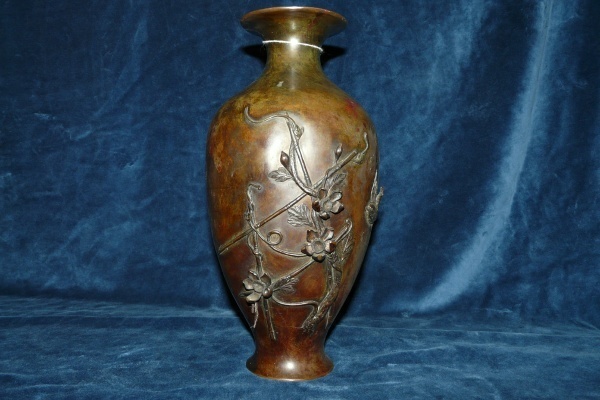 A 19th Century Japanese Meiji period bronze vase, signed. 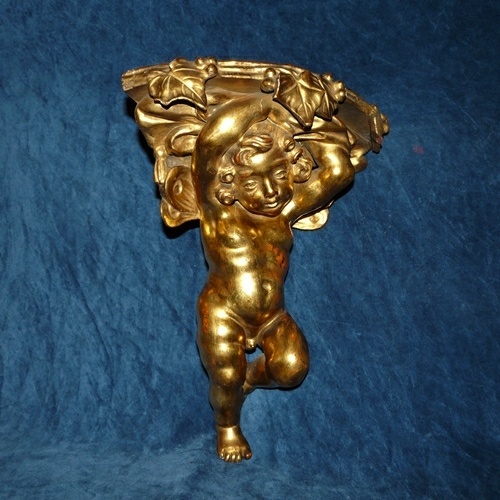 H: 12.5"
A 19th Century, French carved and Gilt-wood Putto Form, Corner wall bracket. 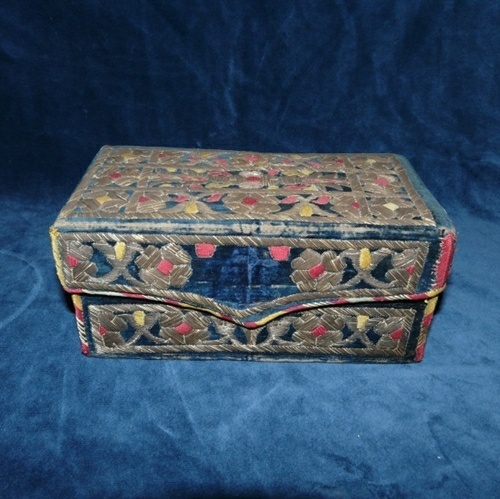 H: 14" x D: 8.5"
A 19th Century Islamic , Ottoman Empire Embroidered box, Metallic silver thread on blue velvet background. 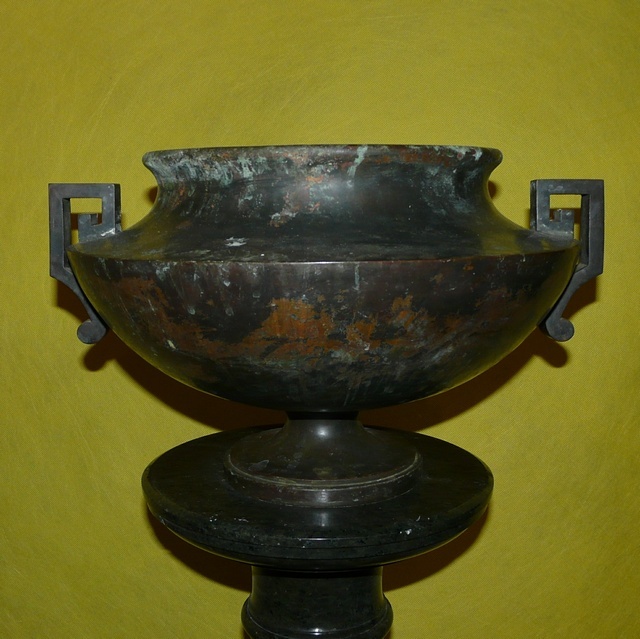 W: 8" x D: 4.5" x H: 3.75"
A 19th Century Patinated bronze and slate urn. Classical form with relief of puttos marching with trumpets and drums, French C1880. 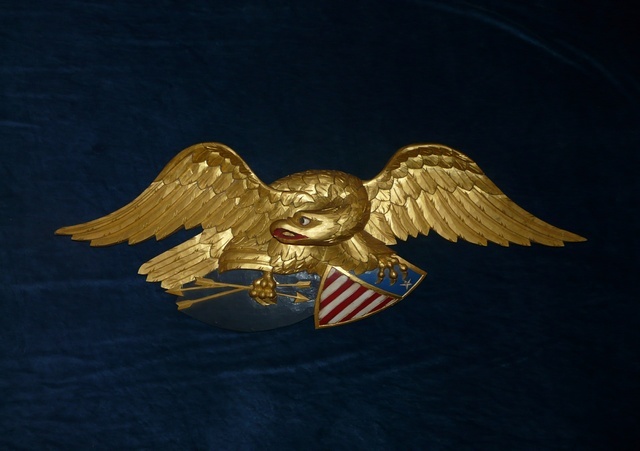 H: 13" x W: 6.5"
A Carved, Painted and Gilt Wood Patriotic American Eagle with shield and Arrows, Early to Mid 20th Century, W: 43", H: 15. 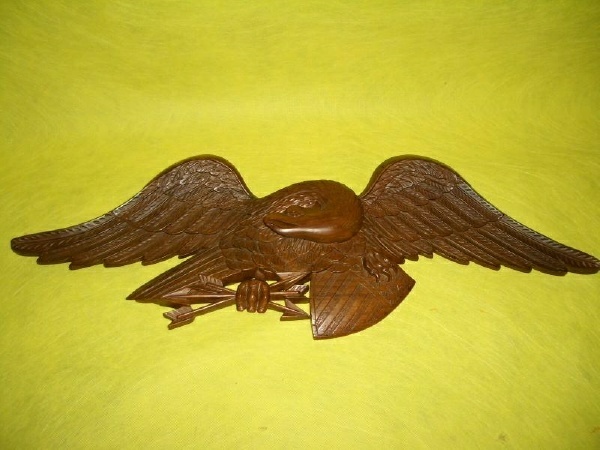 20th Century carved walnut American patriotic Eagle carving, W:44" H: 15". 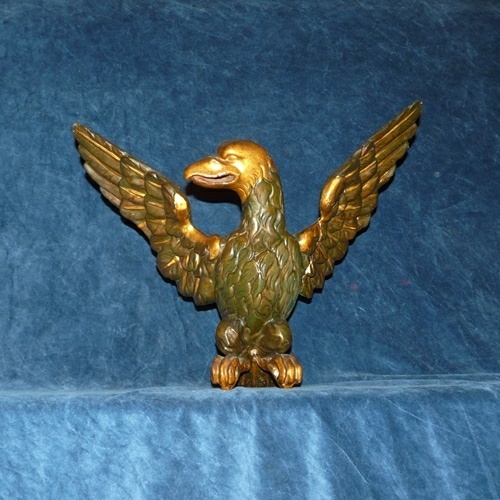 19th Century Carved and painted and partial gilt American Eagle. 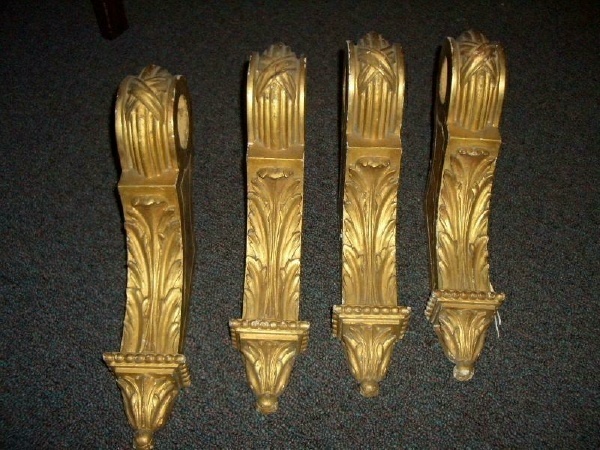 A set of 4 (2 pairs ) 19th Century French, “Acanthus Leaf” Carved and gilt-wood Curtain brackets C1880, H: 13" D: 8" W: 3". 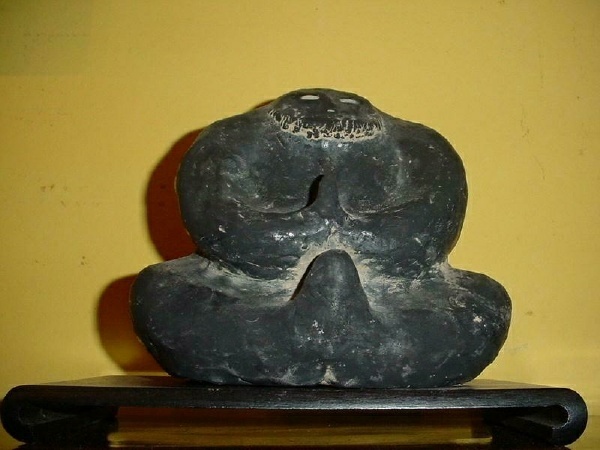 A contemporary Japanese pottery sculpture of a meditating man, W: 7" H: 6" D: 5.5" on wooden base, Signed. 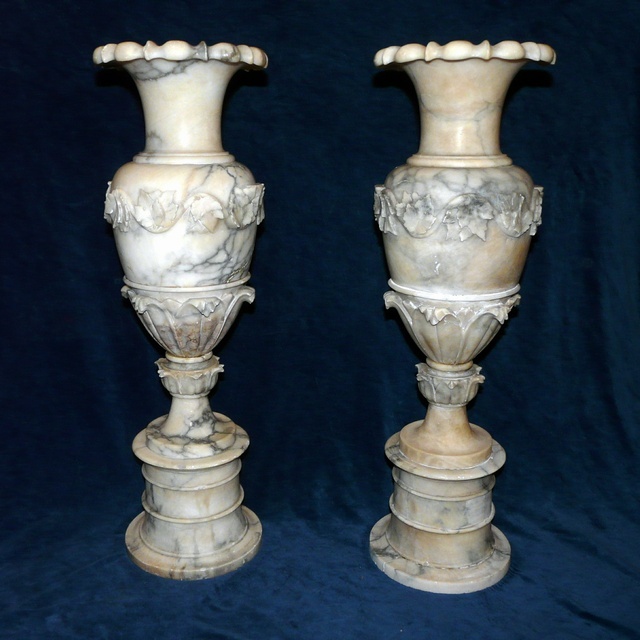 A large pair of marble veneered and inlaid Obelisks, mid 20th Century, H: 23" Base is 8.25" X 8.25". 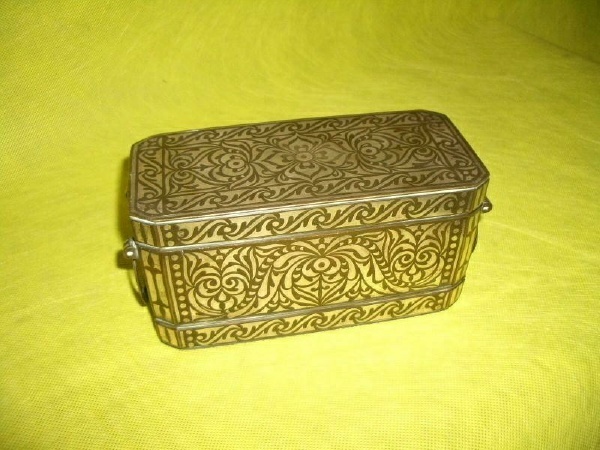 A bronze and silver inlay Betel Nut Box, Moro-Philippine C19th Century, W: 8" H: 4" D: 3.75". 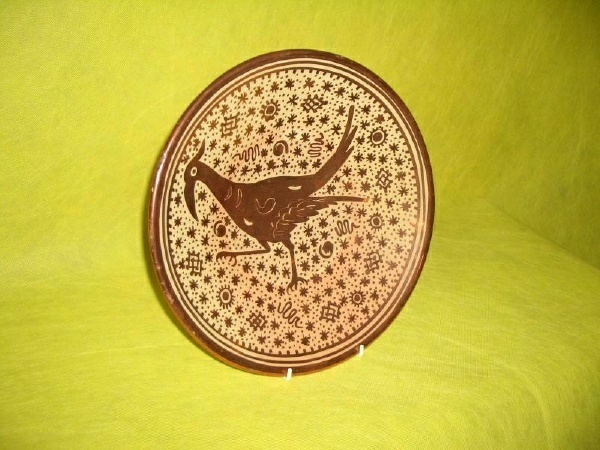 A Hispano-Moresque Pottery plate, Islamic Motif of a marching bird, Copper luster on natural clay color background. (Spain C1890-1900 ), Diameter: 12.5". 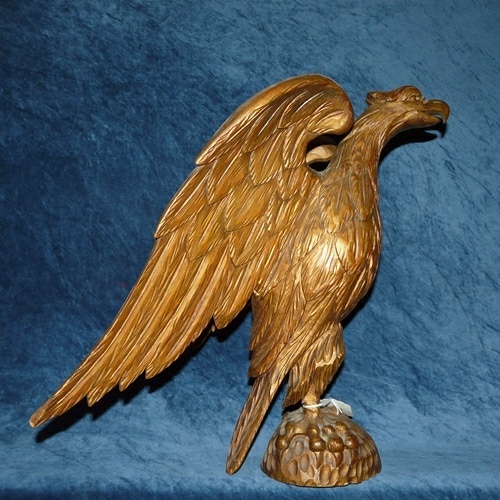 19th Century Carved pine American Eagle, remnant of old gilding on surface. 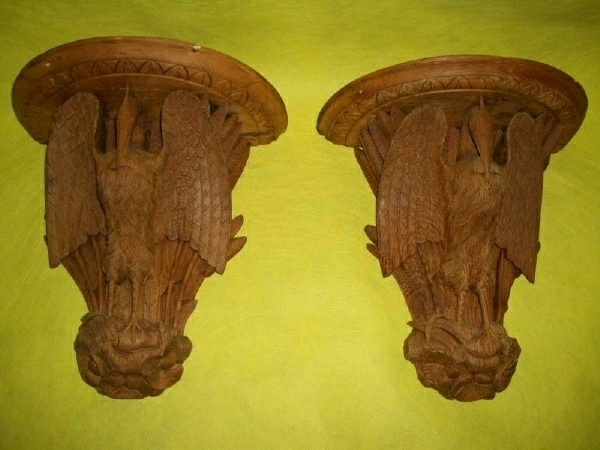 A large pair of 19th Century "Black Forest" wall brackets depicting a Phoenix eating a fish, probably German C1870, H: 18.5" W: 18.5" D: 10".